Camelbak water bottles, BPA free, .5 and .75 Liters, big bite valve, imprinted with your logo and copy, To hydrate smarter, faster,and more efficiently while active. This is a water bottle that my whole family uses. You can bit on the Big Bite and use as a straw or just tip and drink. 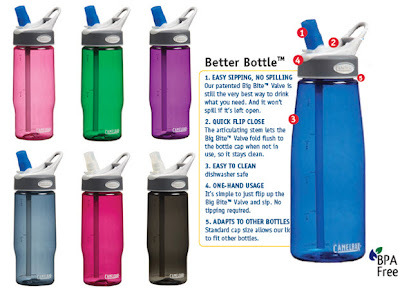 The bottle can be put down on it's side with no leakage. Call Ken at 877-753-5739 for more info.